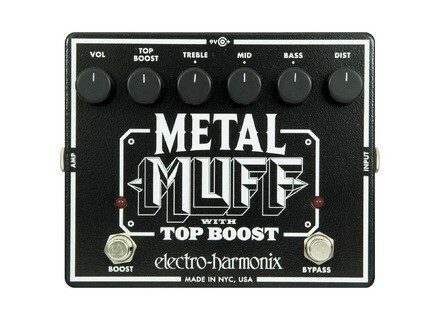 Metal Muff with Top Boost, Other guitar saturation effect from Electro-Harmonix in the Metal Muff series. MGR/Derek Mok's review"Electro-Harmonix Metal Muff"
Primarily a singer, I've been playing guitar for about 10 years, been in a band (drummer! ), and have continued to record and play with other musicians on a non-professional basis. My styles range from folk to hard rock, with heavy power-pop leanings -- Big Star, not Green Day. I bought this pedal from Musician's Friend for $69.99 with a discount coupon. Well, it has a lot of tweakable controls and a top boost function. The price is reasonable, the construction is pretty sturdy. I just don't like the sound of this pedal. 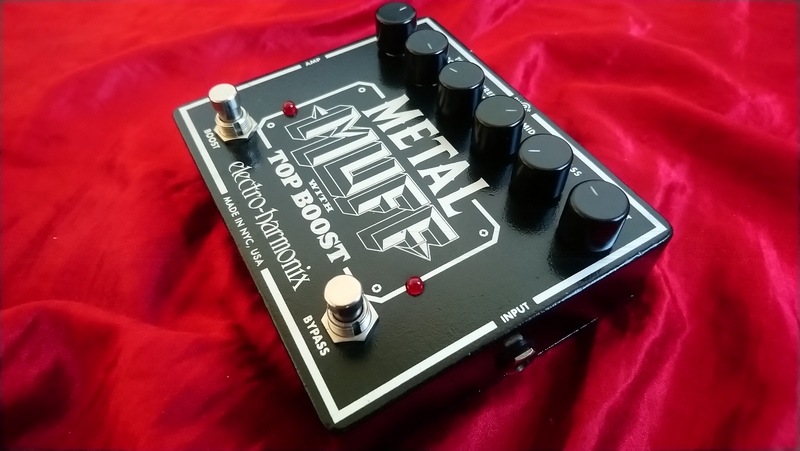 I usually like vintage-style distortion/overdrive, more Black Sabbath/Led Zeppelin than Metallica, and the tone of the Metal Muff was just wrong. I find its tone harsh, artificial, unresponsive to playing dynamics, and one-dimensional. The Top Boost function just makes the sound more papery, and the pedal sounds awful when paired with a Telecaster, and only acceptable with an SG equipped with P-90s. A Gibson Flying V with high-output humbuckers turned into bass mush with the Metal Muff, and the Top Boost only added a tinny edge, not true body or cut to the overall tone. I found myself preferring the natural overdrive of my Vox amp to the tone I get when I add this pedal, and the Metal Muff didn't behave any better with a Line 6 Pod 2.0. Good, the pedal feels neatly put together and durable. I'd hunted for a good all-purpose high-gain unit, and this Metal Muff didn't make the mark. My older Marshall Jackhammer had a more pleasing tone with more variations and more versatility, and subsequently I tried and bought the T-Rex Bloody Mary, which cost three times more than the Metal Muff but also blows it out of the water for tonal complexity, refinement, responsiveness and vibe. I had bought the Metal Muff because of its high rating in Guitar & Bass magazine, but I have to say, I really can't find much to recommend this pedal for. Maybe its sound appeals to somebody else, but definitely not me. James...'s review"Mesa in a box"
Standard distortion box layout. Bass middle treble. Boost, volume, gain. Pedal is digital and I don't believe it's true bypass judging from my ears. Seems solid though. I actually had one of these years ago and recently bought one to see if I still liked it. Neither have had issues. Although they guzzle batteries quickly. I suggest getting line power. First thing is first. The boost isn't really that usable to me. It changes the volume but also the tone, very drastically. It changes the tone so much that it's like you turned on another pedal or something. So I really never use it. You would think EHX would fix this. The knobs also have some odd tolerances and sometimes turning something just a notch can have a dramatic effect on the sound. I have to duct tape my knobs once I get the settings right or I'll bump them and ruin the sound. Overall it's not a perfect design in utility. Here's what's good. If you feed this into a Fender or Fender style clean channel, it turns the amp into a mesa rectifier for all intents and purposes. Everyone is always looking for that high gain in a box pedal that doesn't sound like a bunch of flies buzzing around. This is that pedal. It's very defined and chunky gain. Probably one of the best recto simulators I've ever played. It isn't to be confused as a fuzz though. While the gain does have a fuzzy quality this is not a fuzz pedal. It does have its functional flaws and the boost changing the tone is a big let down. Some players might not be as bothered by this. The sound is next to amazing and I'm chocked at how this can turn a very sterile clean channel into a full on high gain mesa lead channel. I'm not a fan of distortion pedals over overdrives but this one has impressed me continually. 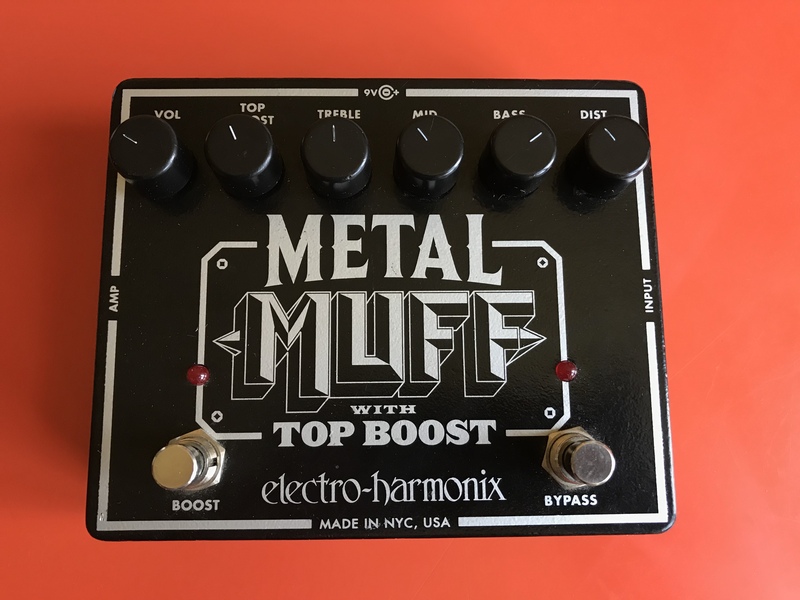 yoTrakkz's review"thick and full "
The Electro Harmonix Metal Muff is an analog distortion guitar pedal. It has a 1/4 inch input and output and is not a rackable unit as it is a foot stomp box. It needs some sort of nine volt power to run on. The configuration of the Electro Harmonix Metal Muff is really simple and straightforward. It simply has three knobs - one for distortion level, one for filer (EQ), and one for volume level. It is easy to get a thick sound from this and is easy to manipulate the different parameters to get a sound that suits your needs. I don't have a manual for this, so I don't know how useful it is when learning this pedal. The distortion sound from the Electro Harmonix Metal Muff is really thick and full. I would recommend this if you are looking for some really heavy, metal-like distortion for your guitar. I have only used this with guitar and it probably isn't all that useful for other instruments or genres other than metal or hard rock. 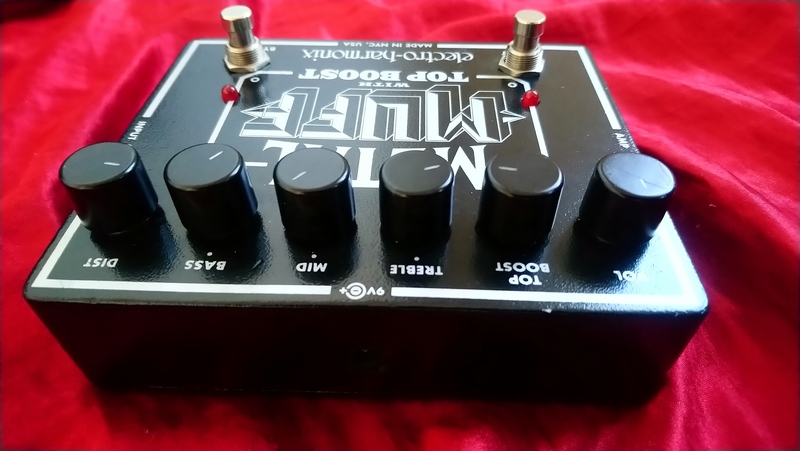 Turning the distortion all the way up will give you a huge tone that is great for getting that fat distortion tone heard on many metal records. 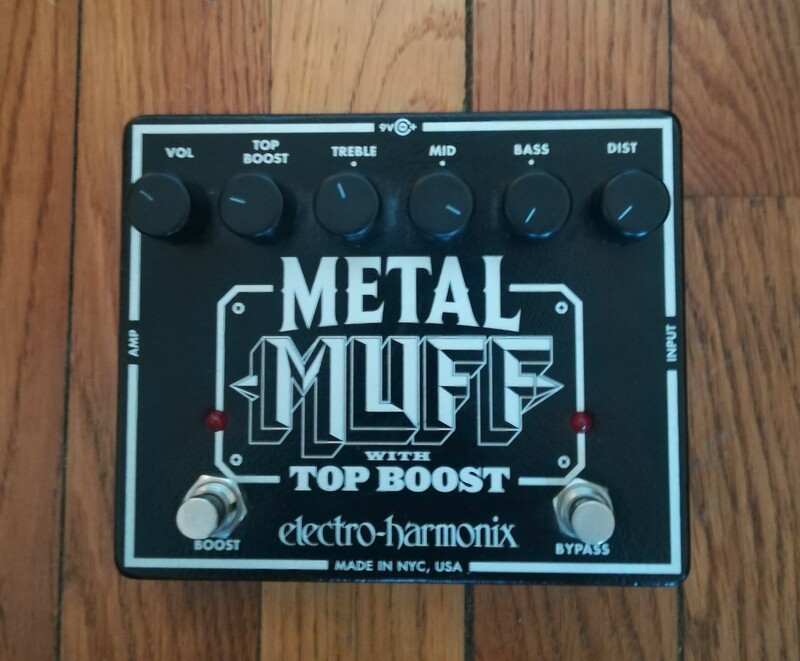 I've been using the Electro Harmonix Metal Muff for about two years. While somewhat narrow in its ability, for getting a thick distortion sound it sounds really great. I would use this more for big rhythm playing rather than lead, but will work fine for both. It is hard to find a pedal that has as thick of a tone as this and the price is dirt cheap if you can get one used and quite reasonable new. If you are playing heavy metal or hard rock and need a pedal that will give you a tone for these types of genres, this pedal is worth a definite look. 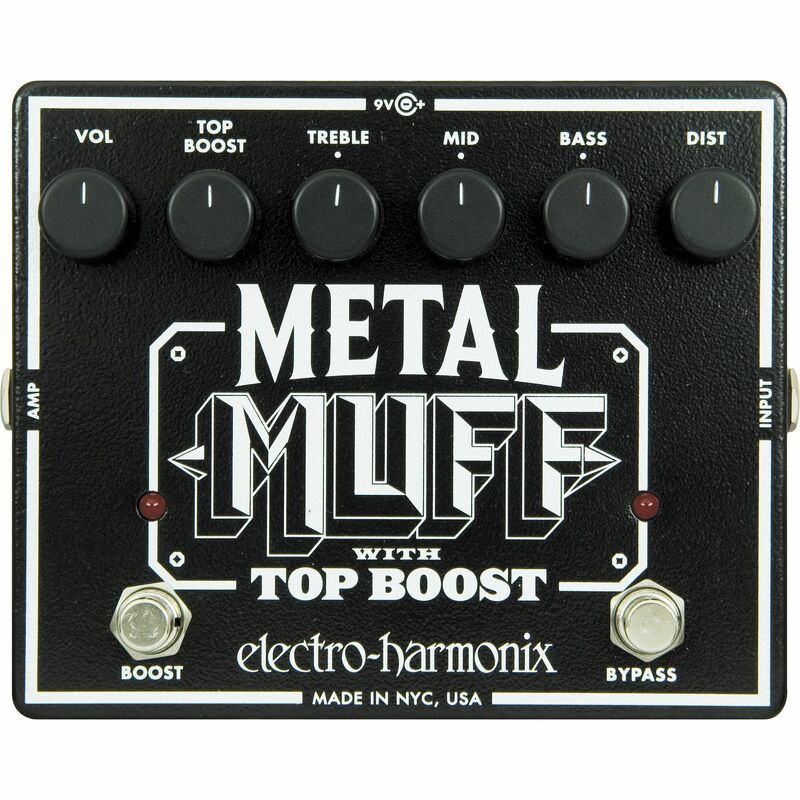 The Electro-Harmonix Metal Muff with Top Boost is an analog distortion pedal. The “Top Boost” feature boosts certain frequencies for solos and has its own level control. It can be powered by 9 volt battery or the included power adapter. The Metal Muff is extremely easy to use. It has six knobs and two buttons. It has a knob for the Top Boost level, gain, lows, mids, highs, and over all volume. One footswitch turns the pedal on and off and the other engages the Top Boost. I briefly glanced over the manual, but the pedal is so self explanatory there is almost no need for it. I use the Metal Muff with a Gibson Les Paul Custom and a Guild S-300D. In my experience I have found that there are not a wide variety of USABLE tones in this pedal. The equalization knobs tend to have one, possibly two, sweet spots in their range of motion. Any more or any less and the tone becomes too harsh or too stifled. I actually think having the Top Boost engaged with the knob set to about 8 o’clock makes the whole pedal sound better and I will often leave it on all the time. This pedal has massive amounts of gain on hand. I usually keep the gain knob set anywhere from noon to 3 o’clock. The Metal Muff has a ton of potential, I only wish it had a more user friendly EQ. J.D. Cronise from The Sword uses one for his distorted tone and it works extremely well for him. I would recommend demoing this pedal with the same make and model amp you own before buying. Knowing what I know now I probably would have gone with a different high gain distortion box. For now it will remain the back up distortion pedal in my rig.